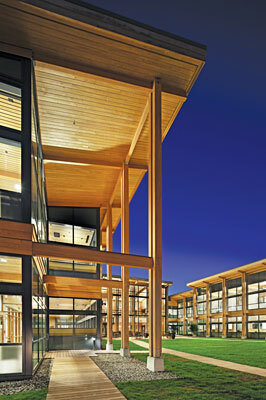 An initiative of the Wood Products Council - a cooperative venture of major North American wood associations as well as government agencies and other funding partners - WoodWorks hosted the 2015 Wood Design Awards to celebrate the innovative thinking that continues to expand the possibilities for wood use. WoodWorks provide free one-on-one project assistance as well as education and resources related to code-compliant design, engineering and the construction of non-residential and multi-family wood buildings, offering support from design through to construction. The WoodWorks staff have expertise in a wide range of building types - from schools and mid-rise/multi-family, multi-residential, educational, to commercial, corporate, franchise, retail, public, institutional and more. 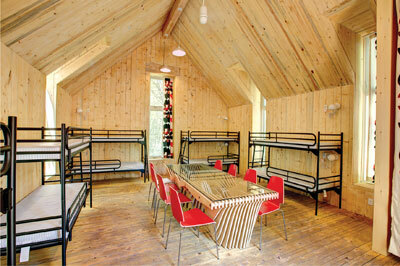 WoodWorks objective is to make it easier to design, engineer and construct wood buildings at less cost. WoodWorks promotes building with wood as it typically provides value - in terms of its beauty, design flexibility and environmental attributes - for less cost than other major building materials. Wood structures can be designed for safety and code acceptance. Wood performs well in earthquakes and high winds, because wood-frame buildings are lighter and have more repetition and ductility than structures built with other materials; they are effective at resisting lateral and uplift forces. Wood buildings are adaptable - in North America, buildings are often demolished before the end of their useful service lives because of changing needs and increasing land values as opposed to performance issues. 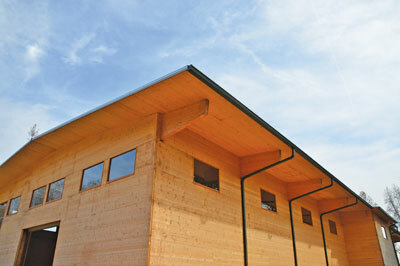 Wood is an inherently green building material. It grows naturally, is renewable and life cycle assessment - LCA - studies consistently show that it outperforms other materials in terms of embodied energy, air pollution and water pollution. 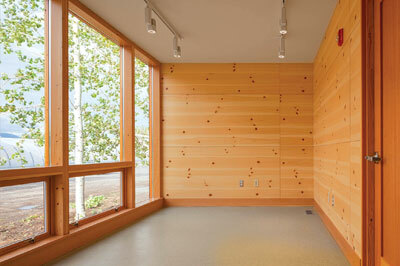 Wood can contribute to a building's energy efficiency and reduce its carbon footprint. It is also thought to have a positive impact on the health and well-being of occupants as well as being an effective way to reduce a building's carbon footprint, as mentioned above. Wood building products continue to store carbon absorbed during the tree's growing cycle, keeping it out of the atmosphere indefinitely. 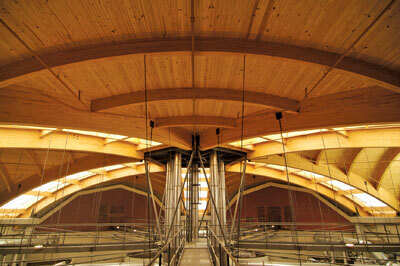 Wood Solutions Fairs are the cornerstone of WoodWorks' educational programme. 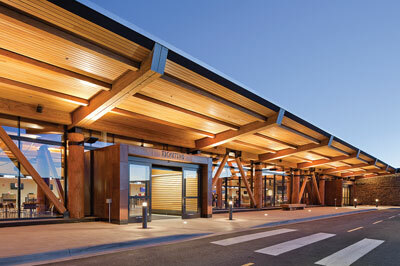 These full-day conferences pack an informational punch with several tracks of concurrent seminars on a wide range of topics, as well as a trade exposition focused exclusively on the design of wood buildings. Fairs are held six times a year across the country and attract hundreds of engineers, architects, code officials and others with an interest in wood design. Other training opportunities include workshops, luncheon seminars, in-house 'lunch and learns' and monthly webinars. 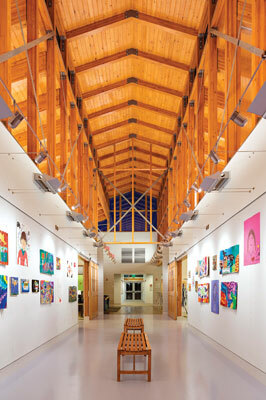 Visit www.woodworks.org for a calendar of upcoming events or to contact a member of WoodWorks regional staff for an in-house presentation. Categories in the Wood Design Awards, presented on 27 January, 2015 included: 'Jury's Choice', 'Institutional Wood Design', 'Wood in Educational Buildings', 'Beauty of Wood', 'Multi-story Wood Design', 'Wood in Government Buildings', 'Green Building with Wood', 'Commercial Wood Design - Industrial', and 'Commercial Wood Design - Office'. As well as these awards, there will also be seven Regional Excellence Awards presented at regional Wood Solutions Fairs, beginning with the Bay Area Wood Solutions Fair in Oakland. Executive Director of WoodWorks Jennifer Cover explains of the Wood Design Awards: "The Wood Design Awards are an opportunity to recognise extraordinary buildings that exemplify, not only wood's beauty, but also the versatility and structural performance attributes that make it such an interesting material to architects and engineers. 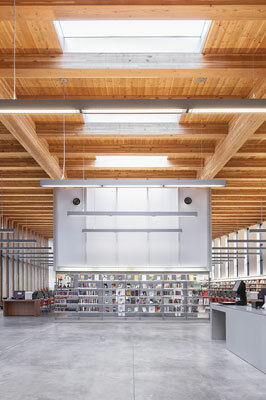 Collectively, this year's award-winning projects celebrate the kind of innovative thinking that continues to expand the possibilities for wood use - and bring wood's cost, sustainability and other advantages to a wider range of projects." 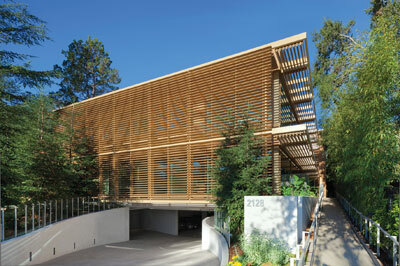 Randall Walter, Bensonwood's head of architecture and design, worked closely with the Burr and Burton team to design and build the environmentally conscious building as a living classroom. They worked to ensure that the building not only fit into the natural surroundings, but truly became part of the learning experience for the students, blending scientific architecture with artistic abstraction. 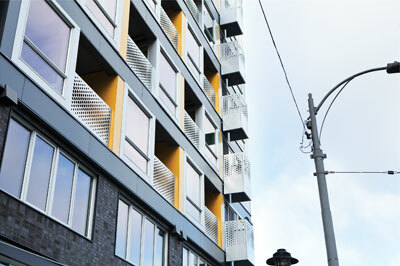 The build is now LEED Platinum Certified and currently produces more energy than it consumes. 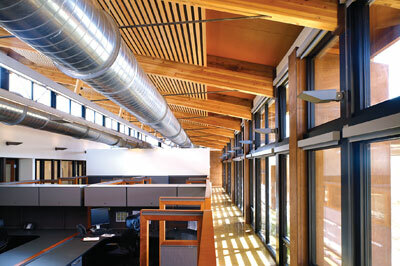 Bensonwood is a full-service design-build-engineering company building sustainably worldwide since 1973. 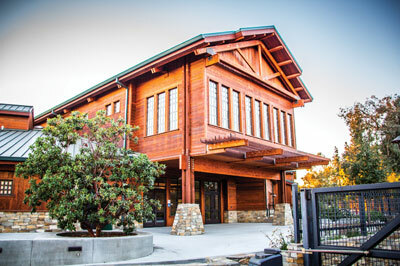 Company founder Tedd Benson is a popular writer and lecturer on sustainable building and led the revival of timber-frame building in the United States 40 years ago, writing several bestselling books on the craft. Paul Murdoch Architects say of their winning building: "The architecture embodies the culture of this innovative company. 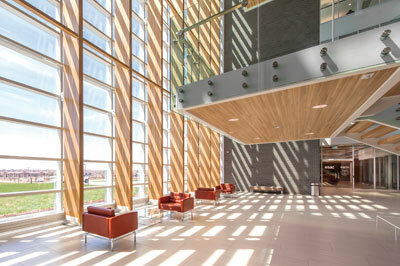 Using strong interior accent colours with fine, straight grained wood, the bold yet understated design of this venture firm's headquarters expresses the company's reputation for both risk taking with clean technology companies in potentially major, disruptive markets and sophisticated, in-depth analysis." Paul Murdoch is founder and president of Paul Murdoch Architects, with over 30 years of experience in the design and management of a wide variety of building projects. Paul has spoken extensively on the critical role of design in improving life through topics such as sustainable development, ecological urban planning, building re-use and the poetics and practicality of recycling. 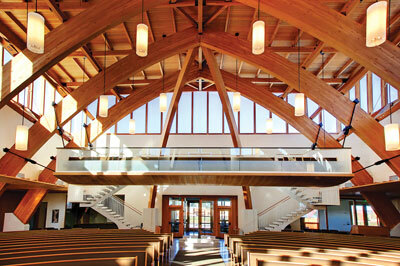 The Georgetown University Calcagnini Contemplative Center serves the retreat programmes for Georgetown University. The centre is comprised of a number of buildings: a Dining Hall, Chapel, Community Building, an existing residence built circa 1885 and 30 cabins. 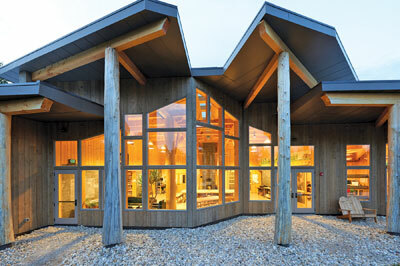 The design is organised around two courtyards; a public one with the dining hall, community building, chapel and entry court, and a smaller-scale private court centred on the ranges of cabins. 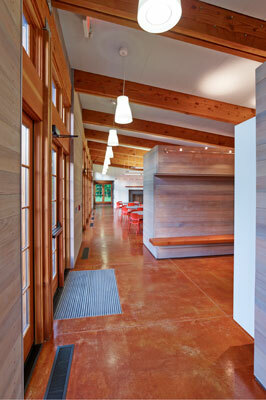 Dynerman Architects is a small, versatile and design-oriented firm, which is led by Alan Dynerman. Dynerman Architects has securely earned a reputation for listening to and embracing their clients' goals, professional service and design excellence. Embracing these essential ideas, their body of work does not cleave to specific styles or trends, formal or philosophical.